Set within stunning landscaped gardens, the historic Griffith House in Anaheim is imbued with elegance and charm. This Spanish-styled building dates to 1919, with rustic red-roofed tiles and whitewashed walls that provide a vintage touch to your wedding photos. The surrounding greenery creates bold coloration in your images and adds a natural ambiance to your special day. You can opt to hold your wedding ceremony within their quaint and intimate chapel, featuring original woodwork and stained-glass windows, or within the more spacious church sanctuary which can seat up to 300 guests. 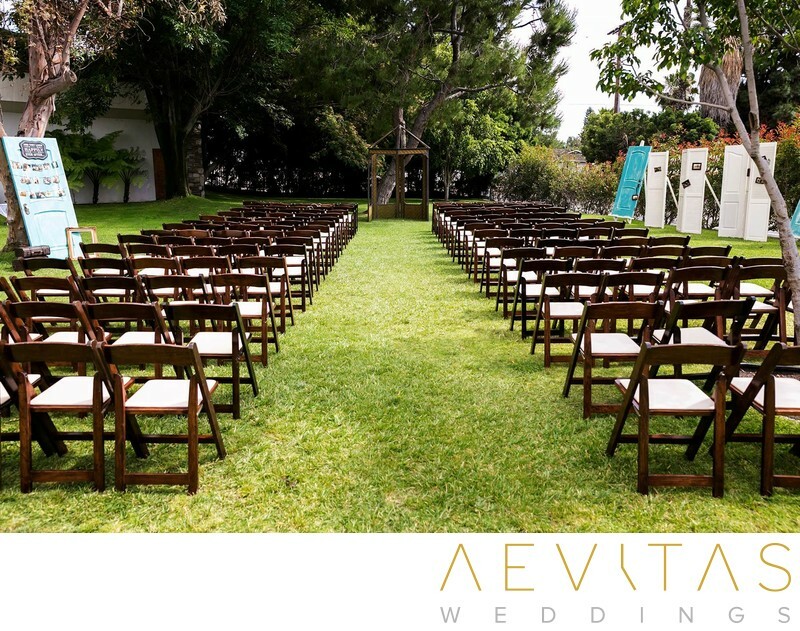 For couples wanting an outdoor ceremony, the sprawling lawns with their white wedding arch and shady trees provide an absolutely gorgeous natural setting and can accommodate large wedding parties of up to 350 people. From ornate alcoves which ooze European charm, to the lush landscaped flower gardens, there are countless places for couple portraits, bridal party portraits and family formals. Then wine and dine, surrounded by your family and friends in the romantic outdoor reception courtyard, adorned in christmas lights and backed by a burbling fountain. There is both a bridal suite and groom’s room for use throughout the event, with full length mirrors and private restrooms, allowing you to capture candid portraits and detail shots as you prepare for your special day. Then hold your first look session in one of their ornate courtyards or in the dramatic interior of their intimate chapel. While The Griffith House offers wedding coordinators to help you plan every aspect of your day, the venue also allows you to bring in your own vendors and completely customize the event. This enables you to create an unique and personalized day, while having the support and expert knowledge of a wedding professional. The Griffith House is a peaceful property which has been beautifully restored to its early 20th century glory. It is ideal for couples wanting a private and classic wedding escape, with historic touches adding undeniable charm and grace.